Performance Time: Approximately 30 minutes, 33 pgs. CHILDREN’S COMEDY WITH SONG. 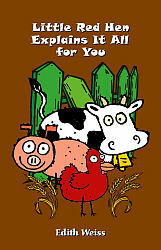 Adopted from the folktale “The Little Red Hen” and the song “Old MacDonald Had a Farm,” this comical play is perfect for kindergarten and elementary school children. In this singing, rapping version, Little Red Hen finds some wheat seeds on Old MacDonald’s farm and decides to grow wheat so she can bake fresh bread in the fall. However, when she asks Old MacDonald’s barnyard animals for help growing the wheat, she discovers the pigs are too busy wallowing in the mud, and the geese are too focused on meditating. The lambs just want to frolic in the meadow, and the cows want to eat grass all day. Even her best friend, Henny Penny, refuses to help because she’s afraid she will get dirty and catch a poultry virus. At the end of summer, Little Red Hen has to harvest the wheat and take it to the mill on her own since the other animals are too busy practicing for the fall talent show. But when the divine smell of freshly baked bread wafts into the barnyard, the animals are suddenly eager to help Little Red Hen...help her eat the bread, that is! Award-winning playwright, Edith Weiss, has published several children’s plays and has directed and acted in plays for both adults and children. Ms. Weiss earned a master’s degree in Theatre from New York University. She lives in Wheatridge, Colorado.